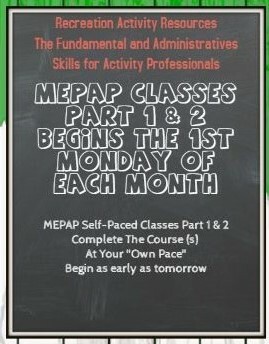 Classes begin the 1st Monday of each Month-Enroll NOW! Need to Make a Payment on a your course? Click on the course topic for additional information. You must be logged in to pay and register for any continuing education course. Alvin Community College; Continuing Education & Workforce Training (CEWD) is proud to announce its support of Recreation Activity Resources. "In connection to our support, we are endorsing the MEPAP, Modular Education Program for Activity Professionals"